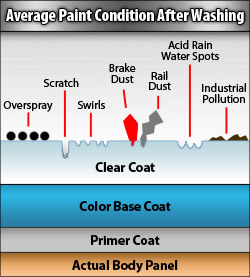 If detailing clay is new to you, you might be thinking, “What is detailing clay and what can detailing clay do for my car?” The short answer is that auto detailing clay removes from the paint what washing cannot. For the long answer, read on! 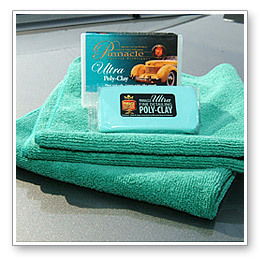 Auto detailing clay is similar to the stuff you played with as a kid, but the clay used for detailing is usually much more elastic, especially in the case of Pinnacle Ultra Poly Auto Detailing Clay Bar. The elasticity gives the detailing clay excellent durability as it is rolled, flattened, smashed and stretched over and over again. There are two different grades of clay currently available to the public. One is a medium grade detailing clay designed to clean the vehicle once or twice a year. This grade of clay removes wax along with anything else on the vehicle. We’re talking CLEAN. Examples are Wolfgang Elastic Poly Clay, , and McKee's 37 Universal Detailing Clay. Your other option is a fine grade that’s relatively new to the industry. It’s called Pinnacle Ultra Poly Clay and it’s a favorite of enthusiasts who prefer to clay as often as needed to keep that slick finish. This detailing clay removes everything the medium clay removes and it is gentle enough to use monthly or as needed for spot cleaning. If you’re someone who’s meticulous about clean, shiny paint (and who isn’t?!) you’ll love Pinnacle Ultra Poly Clay. The Bag Test: There’s a simple test that will indicate whether or not you need to clay. 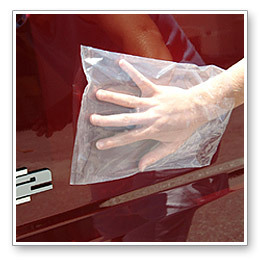 Wash and dry your vehicle, put a plastic sandwich bag over your hand and lightly rub your fingertips over the paint. If it feels gritty or rough, your paint is contaminated. Use a high quality detailing clay bar, like Wolfgang Elastic Poly Clay or Pinnacle Ultra Poly Clay, and a clay lubricant to clean your paint before applying wax or polish. need to use detailing clay. Clay is available in 2 to 8 oz. bars. Two ounces is enough to do three or four vehicles. On average, a vehicle will need to be clayed twice a year. At this rate, one 2 oz. clay bar will last you 18 months to 2 years if used on the same vehicle. If you buy clay in an 4 oz. bar, like McKee's 37 Universal Detailing Clay or BLACKFIRE Poly Clay, cut it in half and keep the unused portions moistened with lubricant in the storage case. NOTE: To optimize both the quality of your claying and the clay's useful life, avoid soap and water as a lubricant. They will prematurely deteriorate today’s clay compounds. Use only clay lubricants. A good clay kit, like the The Wolfgang Polishin’ Pal Clay Kit, contain both the detailing clay and it’s corresponding lubricant. 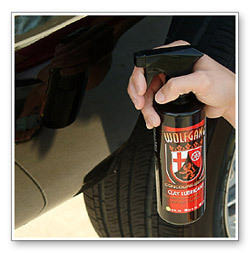 Spray a small area with clay lubricant, no bigger than 2 square feet. Continue these steps until you’ve clayed the entire vehicle. Clay does a marvelous job on glass and chrome, too. Store the clay bar in its original case if possible, or in an airtight plastic bag. Spray it with lubricant to keep it moist. Do not allow the clay to freeze and do not store it in temperatures above 200° F.
Mist a 2 x 2 sq. 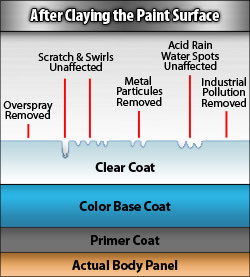 ft. section of paint with clay lubricant. 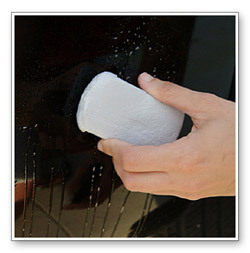 Rub the clay bar across the wet paint until it no longer grabs the surface. Always follow claying with a wax or sealant. Clay will removing existing wax and may leave tiny holes where contaminants have been removed. They must be sealed in order to protect the paint from corrosion. Then use a pre-wax cleaner, like Pinnacle Paintwork Cleansing Lotion, to fill in minor swirls and scratches prior to waxing. If your paint is in good condition, proceed to waxing.